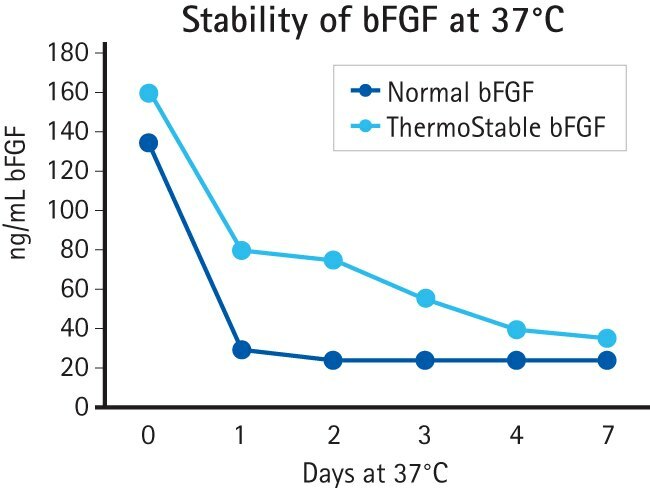 Humankine® Thermostable bFGF displays enhanced stability at both 4C and 37C compared to normal bFGF. 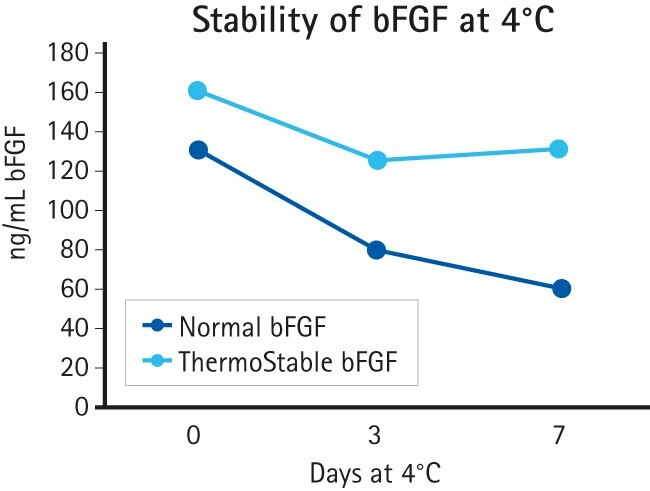 The HumanKine® Thermostable bFGF is a specially engineered recombinant protein with enhanced thermostability at elevated temperatures compared to the wild-type bFGF protein. This humanized protein is produced using a proprietary human cell expression system and s completely xeno-free. This unique protein shows higher stability at both 4℃ and 37℃ while possessing increased biological functionality on both human iPS and human neural stem cell populations. MilliporeSigma is deeply committed to providing novel cell culture systems and characterization tools for stem cell research and primary cell culture. Our highly validated, optimized products provide convenient solutions to many cell culture challenges, so you have the time to focus on your research goals. We’ve created this unique learning center where you’ll find detailed protocols, news on the latest research advances, and user-friendly guides to our vast selection of specialty cell culture products. With the addition of Chemicon and Specialty Media, MilliporeSigma now offers a comprehensive line of stem cell products including human and murine stem cells, media optimized for stem cell and primary cell culture, growth factors, exclusive antibodies, cultureware, and kits to help you jumpstart your research. MilliporeSigma offers a comprehensive range of cytokines and growth factors for cell culture. Every lot produced is thoroughly tested for bioactivity, purity, and endotoxin levels. Whether your project is big or small, we offer high quality recombinant proteins to meet your needs. See below for $’s complete list of Human, Mouse, Rat, Animal-Free and Xeno-Free Cytokines and Growth Factors. Extracellular matrix (ECM) proteins are produced intracellularly and are subsequently secreted into the surrounding cellular medium, actively regulating a diverse range of cell functions including cell adhesion, differentiation, proliferation, migration, invasion and survival. A primary utility of ECMs in in vitro culture is to promote cellular adhesion while maintaining cell viability and maximizing cell proliferation for downstream cell-based applications. Studies show that anchorage dependent cells growing on ECM undergo more efficient plating, have a higher proliferation rate, reach a higher density, and require lower serum and growth factor concentrations—demonstrating enhanced differentiation potential. MilliporeSigma now offers pre-coated multiwell plates in 6- and 24-well formats. Coatings include collagen, fibronectin, and poly-D-lysine. Pre-coated products offer a great advantage to researchers. There is no lengthy coating process, plates are coated by a consistent process and they are always available when needed. Interested in bulk growth factors or ECM pack sizes? Contact customer service or your local MilliporeSigma account manager for a custom quotation.